What Are Depression Physical Symptoms? Although depression is largely known for its emotional symptoms, people who suffer from this condition also experience physical symptoms. The physical symptoms usually make the condition even worse especially if they are not checked on time. In fact, studies on depression have revealed many people who suffer from depression do not get help because they are not aware that the pain they are experiencing is a symptom of depression. Therefore, it is important to understand the physical symptoms of depression in order to get appropriate treatment or help on time. Among the physical symptoms of depression, what you need to look out for is back pain. This is usually worse for people who may already be suffering from back pains. Chest pain is also another symptom of depression, thus it is advisable that you go for a check up from an expert as this can get out of hand if not diagnosed in good time. People who suffer from depression are also likely to register sleeping problems as part of the physical symptoms. These result in the form of poor sleep patterns that you either have problems falling asleep or even wake up too early. Alternatively, you may also find yourself in a situation where you sleep too much. Headaches are also another physical symptom of depression. Sadly, this is the most ignored physical symptom because it is assumed normal. The headaches usually get worse for those people who experience migraines. Depression can also manifest in the form of digestive problems whereby you feel nauseous or queasy. You could also have chronic constipation or even diarrhoea. 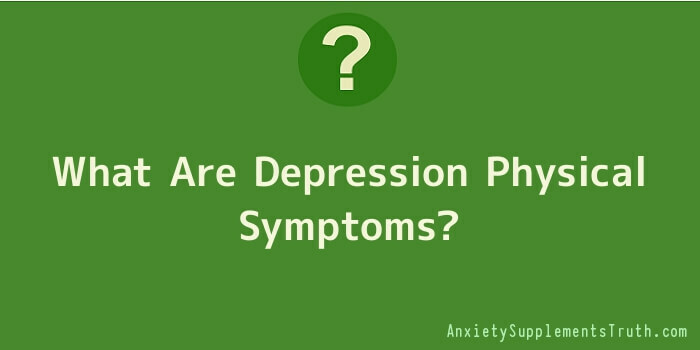 A change in weight or appetite is also another common physical symptom of depression. However, other people may begin to crave for certain foods and consequently weigh more. Exhaustion and fatigue is also a physical symptom of depression that you need to look consider. This is usually evident by the fact that you feel worn out and tired no matter how much you sleep. In addition, you will also find getting out of bed almost impossible. Closely related to this is having low energy levels as this too points to depression. This is particularly true when you do not have the energy to or even the desire to do anything including those things that you like doing as you constantly feel drained. Other physical symptoms of depression include muscle and joint pain that is chronic as well as having a feeling of light-headedness or dizziness. You may also experience problems when it comes to focusing on anything that you are doing due to lack of concentration, as you will always be absent minded. As you can see, most of the physical symptoms of depression discussed above are known to occur alongside many other medical conditions thereby making it difficult for a proper diagnosis to be done. This means that it is important to ensure that you visit a qualified medical practitioner that is capable of carrying out a thorough examination before treatment can be prescribed.